Sometimes it can be hard to get enough protein in your diet due to the fact that it takes a lot of prep time. For that reason I'm always looking for easier ways to get lean protein in . 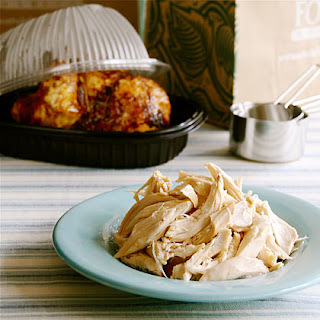 One way that I have found to be quick and tasty is store bought rotisserie chicken. It's usually about $7 dollars for a chicken and depending on how many people you are feeding it can stretch to work for a few meals. I like to take the chicken as soon as i get home, take off all the skin, and shred it. I put it into a tupperware until i'm ready to use it. It will stay fresh for a few days. This can be used with salads, put into quesadilla's or wraps, put on sandwiches, or any other way you can dream up to eat it. It takes out the cooking/cleanup process and it has a great flavor. We love to do that! It makes such great sandwiches!! I don't think you took this picture but you really should start taking some of your own. Think of all of the fun compositions you could come up with! I love that chicken. Sometimes I put it in salad and it is DELICIOUS! i've been meaning to do this and now i MUST! thanks for the tip! It is even better when you get it from Costco or Sam's club, because the chickens are larger and the price is usually less!